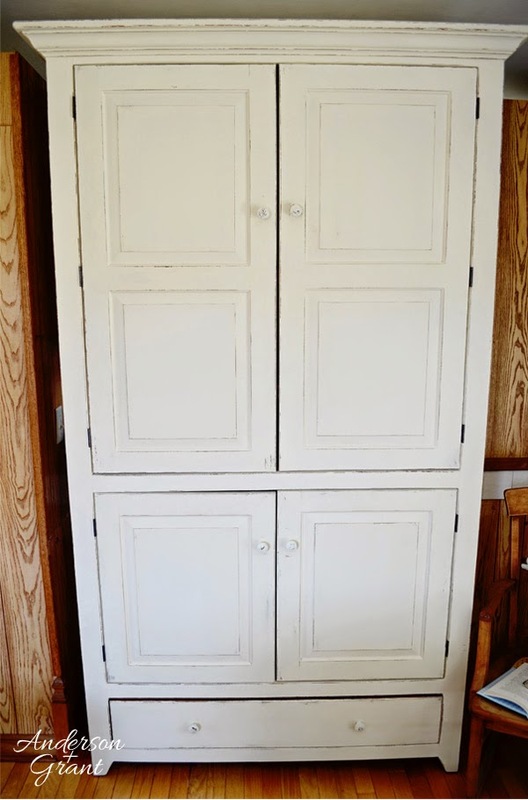 After pre-staining and staining the cupboard, three coats of chalk paint, some sanding, and then waxing, I finished the pantry cupboard my mom has been waiting for. It was actually done a little over two months ago, but I am finally sharing the pictures with you today.....Sorry it took me so long to put an end to this project! I have to admit this project kind of scared me. That is probably why it took me so long to get started at it. I LOVE painting and distressing furniture. It is a hobby that I enjoy without the fear of doing something wrong. But this cupboard brought on a lot of new challenges. First of all, it was an expensive piece. I seriously have never spent more than $10 on a piece of furniture to refurbish and this one was much more than that. The fear of "ruining" this piece of furniture definitely was high. 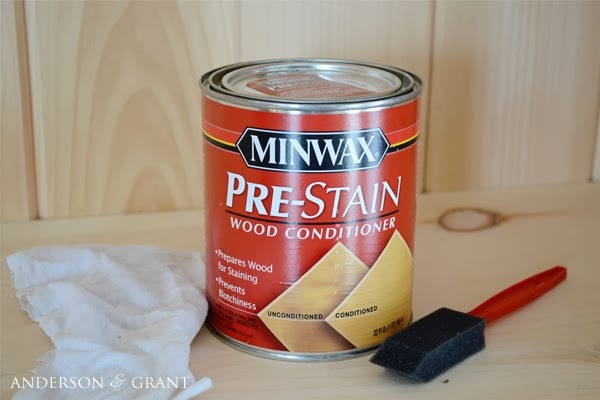 I also had to perform techniques that I am not used to....I've never used the prestain, I actually have not stained too many things, and I have never used finishing wax. I had to do a little learning as I went. And finally, this was a big piece of furniture.....the biggest I've ever done (and probably will ever do again). It was not a project that could be tackled in just a few days. But is is done now and I'm excited about how well it turned out. 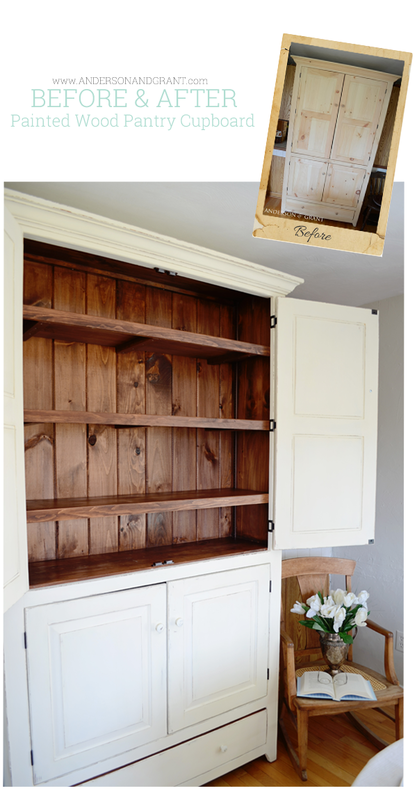 It is truly an amazing piece of furniture and will work so well to store food in the kitchen. 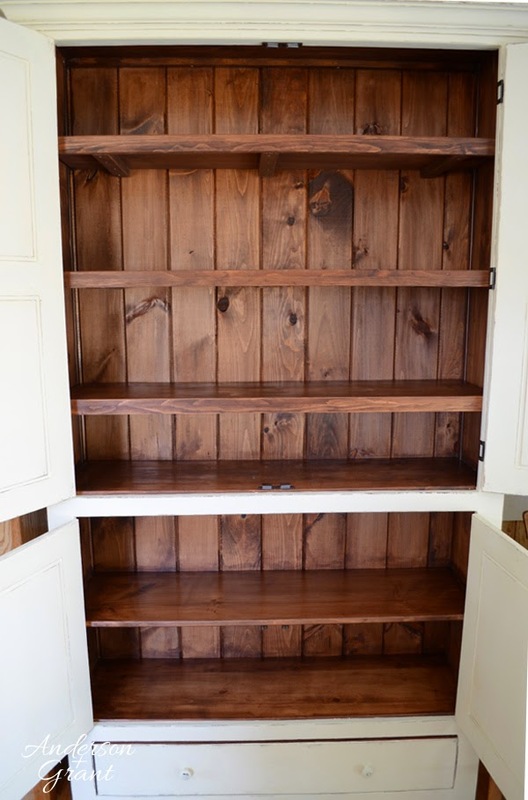 Pantries were once very common in the house and are now really making a comeback. 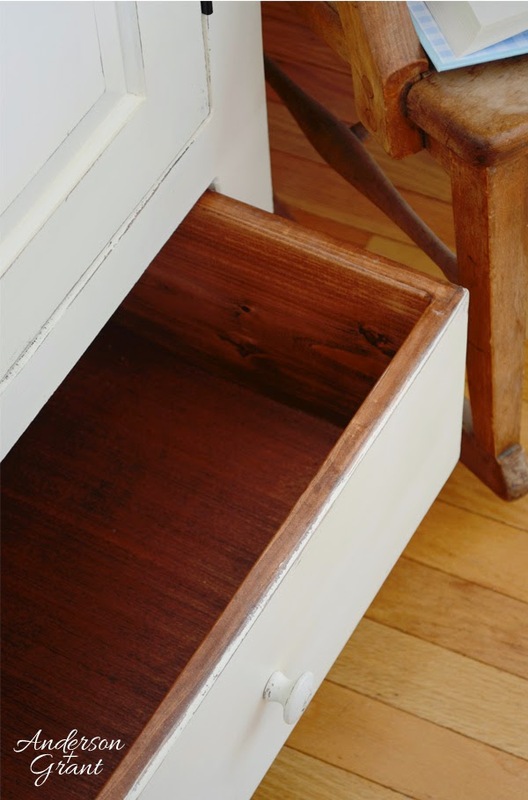 In smaller spaces where the space isn't available for a separate room, a large cupboard like this can be perfect for keeping everything organized. And the piece could be customized even further in someone's home. 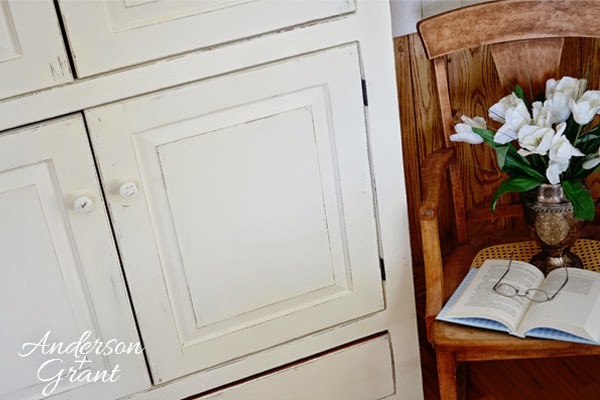 I would love to see the inside of the doors painted with chalkboard paint or covered in cork, providing a place to write grocery lists or pin recipes. 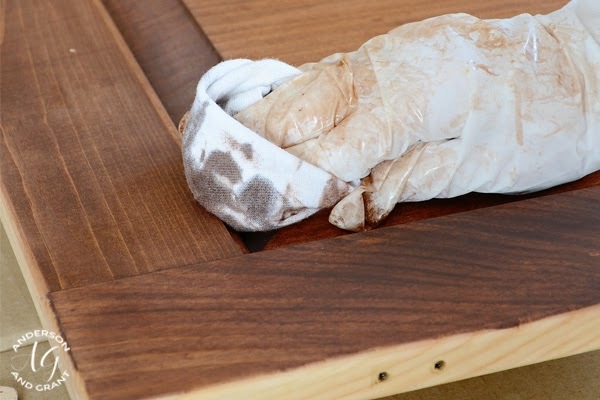 Before painting the stained wood, I rubbed clear wax over the edges to help with the distressing. 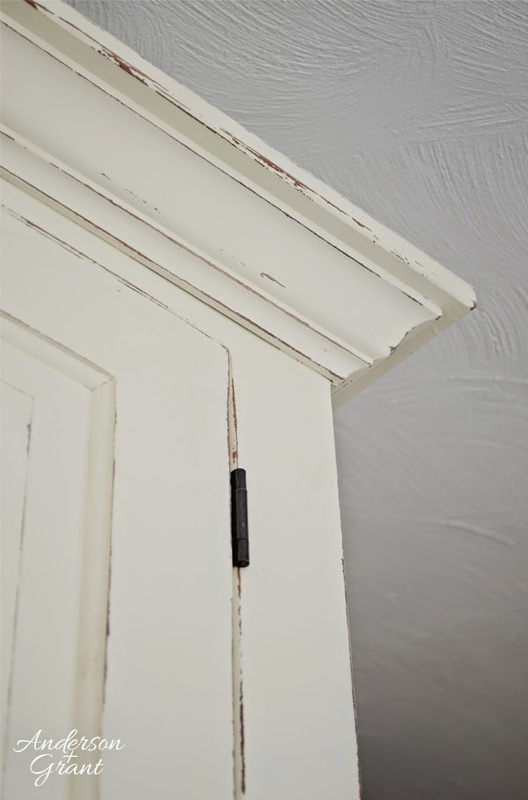 Not only does doing this help the paint chip away more easily, but it also protects the stained wood underneath from being sanded away. Obviously, I didn't rub enough of the wax for the distressing because I would have liked more of the paint to chip away. But I know that will eventually happen naturally where the wax was applied, so I'm fine with it. I actually should have followed one of my earlier tips about getting a better distressed finish by not painting the piece perfectly. I didn't want to mess this cabinet up though....and I can only imagine how my mom would feel to hear me say that I purposely did a poor job painting her piece! 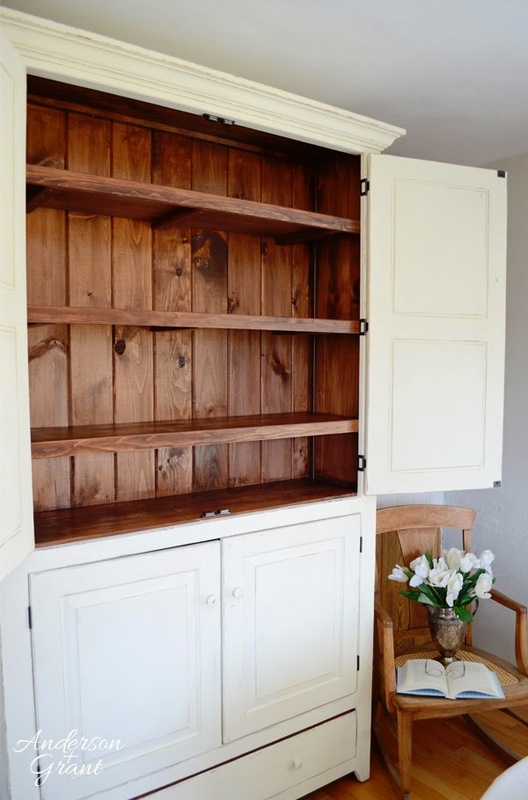 The inside of the cupboard was left with just the stained wood. With boxes and cans being stored on the shelves, I figured it would not be long before the paint would be chipped beyond my liking. The knobs on the doors and drawer will be replaced with whatever is being used when the kitchen is remodeled. Some nice oil rubbed bronze knobs will really finish off the look. For now, I painted the wood knobs that were originally put on the cupboard. It was my first experience with waxing a piece of furniture and I must say that I'm thrilled with the result. Polyurethane has a tendency to yellow with age, and with the paint being white I didn't want this to happen. Waxing the cupboard left a lovely smooth to the touch finish. I'm now a wax convert.....I can't go back to using polyurethane now! 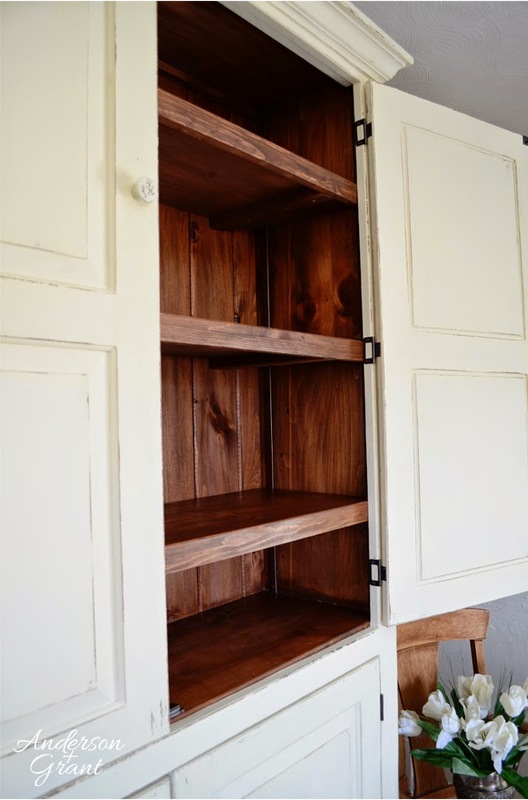 It is so nice to have this project crossed off of my to-do list.....now it can be filled with our pantry essentials and the kitchen renovation can move forward. The paneled area behind the cupboard is going to be removed, opening the entire space between the dining room and kitchen. There was actually a counter top where the cupboard is now....that had to be removed when the cupboard was delivered, so the dining room has been in a stage of transition ever since. I'm really excited about seeing the entire space transformed! 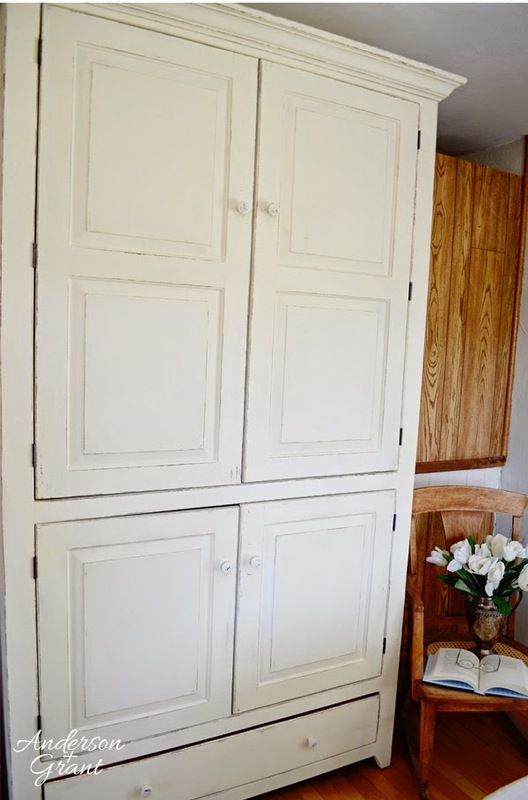 BE SURE TO CHECK OUT THESE POSTS FOR MORE INFORMATION ABOUT THIS CUPBOARD!